Step 1: Be a FOCUSED termite! Step 2: Build your mound! Step 4: Focus on how brilliant your mound looks in the form of value to your customers…..and JUST KEEP BRANDING YOURSELF AND YOUR BUSINESS! Ian Thompson is a former advertising and marketing executive from the UK and Hong Kong. He has worked with clients like British Airways, Dr. Scholl’s and Hong Kong Telecom. 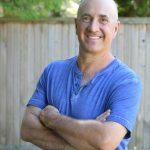 He set up his own advertising firm in 1995 in Vancouver and then joined his wife Jini in her health business – when her readers demanded an online health store in 2002. Ian loves to inspire, encourage and support entrepreneurs to be THE FULL BUSINESS!